Hi all, you may have seen on our Facebook page recently that we took a quick trip to the beautiful city of Bath for my birthday this weekend, and during that time we hit the tremendous milestone of 600 likes! Thank you all so much for sharing and commenting, if you haven't joined us already then please do so, we'd love to keep in touch. So as you may already know, the beautiful city of Bath has a rich heritage and its Roman origins are still embraced by the community, such as the Roman Spa Baths and the surrounding cobbles. On first inspection, the city itself may not sound very accessible with lots of small roads, narrow and high pavements, and the inevitable torture device that we know as cobbles. But, we had an absolutely lovely time and can definitely recommend visiting Bath to other wheelchair users. Let's take a step back before I go into the city details, as I want to talk to you about my experiences with the Thermae Bath Spa, the UK's only natural thermal spa and one of the most popular attractions in Bath. I was really interested in visiting the Spa after we had to skip the Széchenyi Spa in Budapest during our stop there in May, and fancied a little pampering for my birthday. I enquired via email as I couldn't find too much information on their website regarding accessibility, and explained that although many of the packages are for couples, I'd need a third person to assist me with transfers who could access the spa pools but not have any treatments or be included in the meal package. Their response stunned me, and I can only do it justice by pasting it below. What do you make of this then? The UK's leading thermal spa, luxury resort is far from accommodating to the less able. My response, as I'm sure you can imagine, was firm in expressing that this was not satisfactory for my needs nor for many other disabled visitors. And just for those who're interested, here's my response, of which I have yet to receive a reply. "Thank you for getting back to me, and thanks for all of the information you provided. 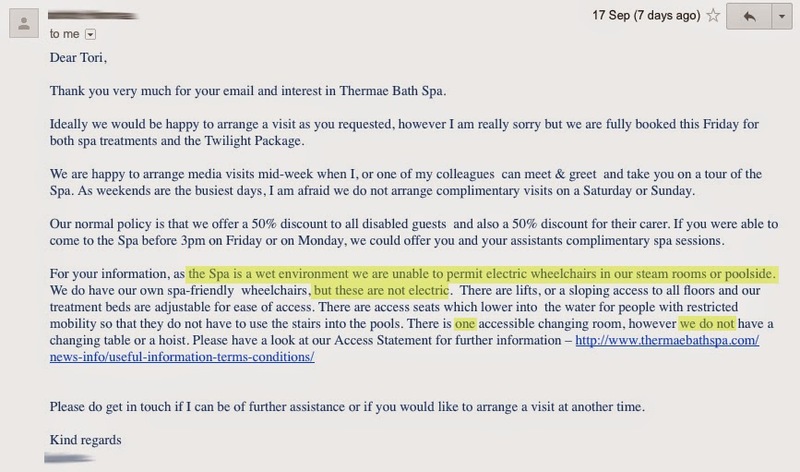 Sadly, we won't be able to make it to the Spa during weekdays due to work constraints, which is such a shame as i'd love to be able to write about the spa and its facilities for disabled visitors. Im really concerned on two points that you mentioned though, firstly that your one accessible changing room doesn't have a bed or bench? This is a massive disadvantage for any wheelchair user, whether they are fairly mobile or not because transfers are incredible difficult without it. I cannot transfer myself and would need a mobile hoist (in actual fact they're not so expensive and more and more swimming pools are providing Changing Places style facilities to allow disabled people to be involved too), and I think the vast majority of disabled people would be in the same boat as me, so by not having even a fold down bench bed is a little disappointing. It's great that your treatment rooms have height adjustable beds but, without a mobile hoist, there would be no way for a lot of disabled visitors to transfer onto it, sadly. I can appreciate that electric wheelchairs aren't allowed poolside and in any saunas, and i'd really like to see a photo of the chair you provide please? As another point to make, our wheelchairs are specifically designed to aid our independence and millimetre differences in our seating can affect our abilities and strengths. For example, I cannot sit in a standard chair and therefore to borrow a basic chair for a few hours would not be a relaxing experience at all. Would you allow people to transfer from their own wheelchair to the pool lift chair at all? I think there's also an accessory for these pool lift chairs to have a bar on them to lift from a sling which is far more accessible, comfortable and dignified for disabled visitors. I know I come across as a little over the top but I wanted to mention this all to you because I feel strongly about the inclusion of disabled people, after travelling around Europe and seeing the vast accessibility features that other countries have to offer, its sad to come home to England and face difficulties. I find it a little disheartening that such a prestigious and luxurious facility such as your own doesn't accommodate disabled visitors as well as it should do, with not even the basics of a bed in the changing room. I really hope that i'm able to visit you one day, I live in South Devon so its not far at all, and having a luxury spa treatment would be an incredible experience not only for the pleasure of it but the pain relief it offers for my aching bones! Once again, i'd be really interested in seeing a photo of the pool wheelchair (and possibly the accessible changing room please?) to see if its viable for me to visit you in the future." I'm sad. I'm really sad that places like this are not able to accommodate disabled people, whereas in Budapest the resort was doing all that it could to make the historic baths accessible, and this purpose built modern facility doesn't even give a second thought about access. In reality, what's the cost of a mobile hoist with a "bring your own sling" policy, a pull down changing bed for the changing room, and either the bed or hoist spreader bar attachment that can be fitted onto the pool chair which is already in situ? For a company that reaps in as much money as they do, it can't be a huge gap in their pockets to at least try to include disabled visitors. And what infuriates me the most, is that I haven't had a single response from the company so they really don't show any signs of caring or changing. Shame on you. On to the trip itself! We stayed at Bailbrook House, a beautiful manor just outside the city centre. We had a fair few vouchers stored up through Hotels.com from our eurotrip so we were able to receive about 75% off the price, what a dream come true! To tell you the truth, David used to work for a company supported the hotel for all their IT needs as so he knew of the hotel beforehand, it's recently been renovated by the Handpicked chain and it's absolutely gorgeous, all very clean and made luxurious since David last worked there a year ago. This gentleman didn't seem to mind us taking photos of him with his pipe, but I think he adds to the picture. There's a side access for wheelchair users, with a lovely level access pathway to a glass walled galley which leads into the reception, and all the staff were very happy to assist. The accessible entrance felt just as luxurious as the grand main entrance, so I really didn't feel put out in going through a separate doorway. You may also like to know that this hotel is the first I've even stayed in in my entire life who have requested a fire safety form to be filled out detailing my abilities incase of a fire, absolutely fantastic service. Our 'classic' rooms were in the newer section of the hotel with level access throughout and being on the ground floor I felt perfectly safe, even if we were opposite the fire escape. The room was very spacious and had lots of gadgets like USB charge points, but unfortunately the bed was a divan so I couldn't get my hoist legs underneath it for transferring. Being ever-prepared, we had our bed blocks at the ready and you can just about see in the photo that we were able to raise the bed suitably. The bed is however on wheels rather than feet, so the bed raisers had to be removed once transferred or the bed moved when turning! The carpet was fairly long so it meant the hoist was a bit trickier to move across the room, but it was manageable. The bathroom was very big but not necessarily equipped for disabled guests other than a lowered sink, easy turn taps and grab rails with an emergency cord- there wasn't a pull down seat in the wet room shower and the shower head is a fitted rainfall head so that would have been difficult to use, there is a smaller hose to use if required. But I have no doubt that the staff would have done all they could to find a chair if I had requested so, but on first impressions the bathroom could have been a little better. Breakfast at the hotel was all lovely and they had a great variety, the staff were happy to assist wherever needed and the cleanliness throughout the hotel and dining area was superb. The fried breakfast was tasty and not at all greasy, and the muesli, fresh fruit and seeds all looked delicious, but the selections of the menu (which are no extra charge) such as kippers, porridge and pancakes sealed the deal for a deluxe breakfast. Prices for evening meals were inexpensive and tasty, as were the bar drinks. In all, we were really pleased with the hotel and being so close to the city, I'd definitely recommend it for wheelchair users. In the evening, David and I wandered around the dark city enjoying the lit up buildings and beginning to get a feel for Bath before exploring in the morning. We were lucky and managed to park on a double yellow line with our disabled parking permit, even though the hotels reception that parking would be difficult as spaces are limited. 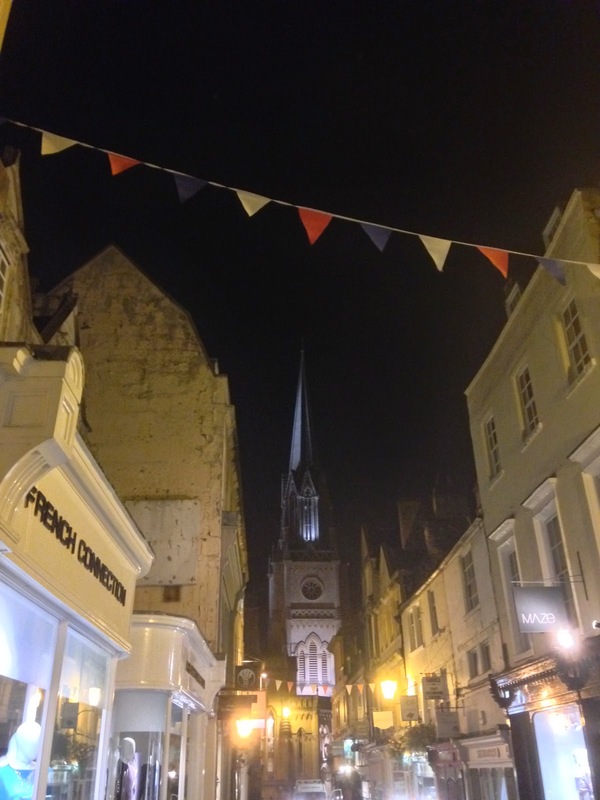 We ate in a beautiful little courtyard called Milsom Place near to St Michaels Church in the old centre, and toasted to my birthday and the delicious food at Côte Brasserie! The pavements genuinely weren't as bad as people made out, and we barely came across any cobbles, mostly large worn down flagstones which weren't a problem. But we did find that dropped curbs were fairly sparse but since the town is mostly pedestrianised, I stuck to the roads and pavements where possible. I noticed that many of the shops in the older side of the city were not accessible, even if I had my ramp to help me in, there was the tall pavement to contend with as well as a shop step so it wouldn't have been viable anyway. It's a shame as my first ever published children's book called 'The Phlunk' was first sold in Mr B's Book Emporium which we managed to find but is sadly not accessible. The next morning, we set off for the city centre again and expected mayhem due to it being a Saturday AND the first weekend for students to return to Bath Uni, so we thought we may have seen lots of sad parents walking around. Thankfully not! We parked quickly and easily in the Southgate underground parking lot which had ample parking for accessible vehicles. It's in the main shopping precinct so its all pedestrianised and modern, with all my favourite shops! But we were headed for the Roman Baths, and set off on our way. The queue was long and round the side of the building, but within 10 minutes we were in and paying. There was a free ticket for my PA and David went in as a student so it wasn't too expensive, and once you've paid you can walk around at your own leisure. I can remember visiting as a child but it wasn't too wheelchair friendly, now it's about 75% accessible and baring in mind that Romans didn't really plan ahead for electric wheelchair access requirements, I think that's perfectly understandable. The flagstone flooring along the main balcony is perfectly accessible for wheelchairs and the lifts taking you to lower floors are strictly only for the mobility impaired so we didn't have to queue because a family of 8 wanted to use them or any other lazy people for that matter. Downstairs in the museum section, everything was accessible for wheelchairs apart from the beginning where you see an open Roman sarcophagus which I'd have liked to have seen because its a bit gruesome! But the lift enters the exhibition at the end, so we though it best to trek to the end (actually the beginning for everyone else) and walk back on ourselves. I must note though that the flooring around the main bath is not particularly even. I'm a bit ambitious as wanted to see as much as I could so I did drive through a few deep but dry drainage gutters to allow me to access the hot rooms, but I paid for this later with a sore back. If you're delicate, stick to the first corner of the bath as its the most level. The curators have truly done a good job in keeping the flooring as smooth as possible for wheelchair users, but know that there are some HUGE holes too so you'll need to really plan your route as you go. Most visitors were very accepting and understanding as they watched me zig zag across the path! Don't be afraid of Bath if you're in a wheelchair, the access is sometimes limiting but the beauty of the city makes up for it tenfold. There's plenty more to see and do, all of the attractions have accessibility in varying levels (apart from the Thermae Spa, of course) and it's extremely easy to wander around between them. There's no need to worry about public transport, but if you do require it then all of the buses and bus stops had wheelchair access points. Bath, I think i'll be returning sometime soon.